ABC Family is planning to premiere Home Alone 5: Alone in the Dark this December for their "25 Days of Christmas" lineup. The will focus on a young boy, Finn, who's family moves from California to Maine. Finn suspects that the house is haunted and sets traps to catch the ghosts, but instead stymies 3 would-be burglars. Macaulay Culkin’s career may not be what it once was, but the franchise that shot him to fame apparently lives on. ABC Family has just announced the start of production on Home Alone 5: Alone in the Dark, which will premiere on TV later this year as part of the network’s “25 Days of Christmas” programming block. And before you even ask, no, Culkin, Joe Pesci, and Daniel Stern aren’t involved — but Edward Asner, Debi Mazar, Eddie Steeples, Malcolm McDowell, and the guy who directed Garfield are. More details after the jump. The first Home Alone proved a smash hit when it opened in 1990, quickly inspiring a New York-set sequel that debuted in 1992. Although Home Alone 2: Lost in New York wasn’t quite as successful on a commercial or critical level, the franchise really lost its way with Home Alone 3, which featured none of the main cast or characters (though it did star the Janitor from Scrubs and a young Scarlett Johansson). The series returned to Kevin McCallister and Marv in the made-for-TV Home Alone 4: Taking Back the House, but with new actors in the familiar roles. 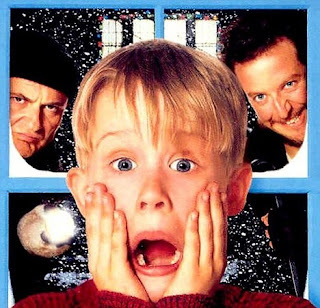 Like the previous installment, Home Alone 5 will make its debut on the small screen; like the entry before that, it’ll center around new characters. Aaron Ginsburg and Wade McIntyre‘s script follows an eight-year-old named Finn (Christian Martyn), who’s unhappy with his family’s decision to move from California to Maine. His fears are compounded when he begins to suspect that the new home his haunted, and he devises traps in hopes of capturing the ghost. Instead, the traps catch a trio of burglars (McDowell, Mazar, and Steeples) who target the house one night while Finn and his sister (Jodelle Ferland) are home. Peter Hewitt, whose past credits include Bill & Ted’s Bogus Journey and Garfield, is directing. I want to say I’m surprised this is happening, but seeing as this year’s upcoming releases include a 21 Jump Street adaptation, a Titanic re-release, American Pie and Men in Black sequels, and a Total Recall remake, it has the ring of inevitability about it. Home Alone 5 will air on ABC Family sometime this December.